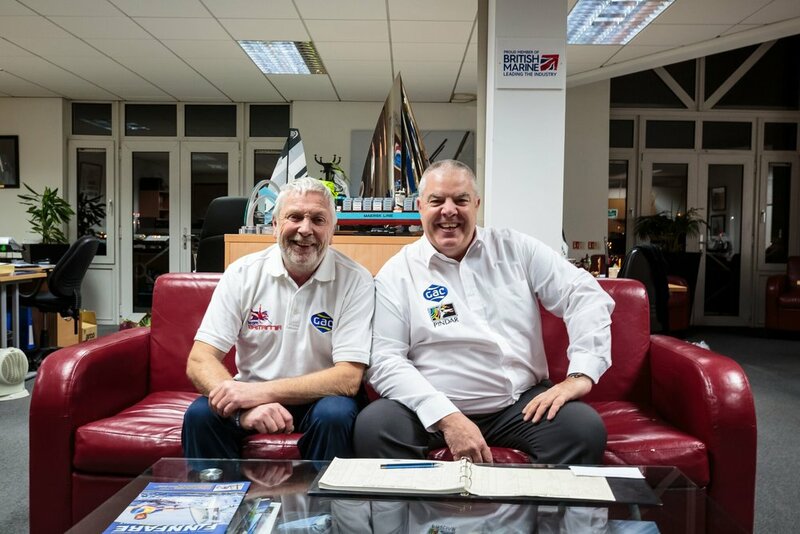 Team Britannia has announced that logistics experts GAC will now be supporting the 80ft powerboat and its 12-strong crew with their environmental programme and land-based activities, as well as the bunkering and storage services they originally signed up to provide last year. The new agreement was sealed at GAC’s UK marine leisure logistics and superyacht services hub in Southampton by team principal and ocean racing legend Alan Priddy and Superyacht Services Manager, Fergus Poole. Team Britannia are planning a programme of activities at each of their stops, including engaging with young people about the damage being caused to the marine environment by pollution and how this is killing around 100,000 sea mammals and many more fish and birds a year, not to mention the effects on human health as a result of plastic in the food chain. The news of GAC’s increased support comes just two months after the announcement that British sailing legend Alan Goodwin (80) has joined the team as Land Director. The former Royal Navy Submariner took part in the first round the world powerboat record attempt in 1998 as a crew member of Cable & Wireless Adventurer. Team Britannia will use a boat designed by Professor Bob Cripps, former Technical Director of VT Halmatic. It will slice the waves, rather than surfing them, with its super-efficient design, a variant of the “fast displacement hull.” This reduces fuel consumption by up to 30 per cent, and should make the 23,000 mile trip smoother. In addition to the fuel-efficient design, the vessel will be powered by a revolutionary fuel emulsion developed by Clean Fuel Ltd, a mixture of diesel, water and emulsifier that when burnt reduces harmful emissions such as particulate matter and NOx. Construction of the 80ft RIB boat is well under way on Hayling Island, near Portsmouth, at the Aluminium Boatbuilding Company. The hull was completed and turned last year and the installation of the six massive fuel tanks is well under way. Once fitted, the next job will be to install the engines and jets before the wheelhouse is craned into place. In total there are more than 2,300 pieces of metal that will be welded together by master boatbuilder Paul Johnson and his team. The boat will be launched in early 2018, and will then commence sea trials, which will include sailing round Britain, and London to Monaco. Finally after a fortnight long nautically themed festival in Gibraltar, Team Britannia will set off on their 23,000 nautical mile world record attempt from the famous racing mark at Europa Point.